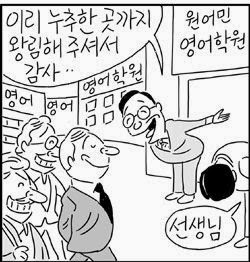 Regarding the Kyunghyang Sinmun cartoon I posted yesterday, I realize now (via the Marmot) that the case of the artists, as is noted by the Hankyoreh here, refers to "Africa Museum of Original Art, which caused a furor by treating its performers like slaves." The artists are from Zimbabwe and Burkina Faso. What's fun is that the current chairman of the museum is Hong Moon-jong, secretary general for the ruling Saenuri Party, hence the interest of the Hankyoreh and Kyunghyang Sinmun. As I noted before, the latter paper, which published the cartoon, had made the point about double standards of treatments of foreigners in this 2005 editorial [that post looks closely at how that double standard has been portrayed over the years]. It slipped my mind, however, that it also published this op-ed article by Anti English Spectrum's leader, Lee Eun-ung, in early 2009, so perhaps it makes sense that their cartoonist would make a similar comparison once again. What was interesting was that this wasn't a response to a foreign teacher being busted for drugs - it's simply taken for granted that foreign teacher = drug smuggler. For whatever reason the Kyunghyang Sinmun sees foreign English teachers as fair targets, while the Hankyoreh, which also sits at the same end of the political spectrum, has never targeted foreign teachers in this way. "For whatever reason the Kyunghyang Sinmun sees foreign English teachers as fair targets, while the Hankyoreh, which also sits at the same end of the political spectrum, has never targeted foreign teachers in this way." Yes, this is a genuinely interesting area for study! Not only has the Hani generally avoided the intentional digs at English teachers but they have published some pretty important and progressive articles. Is the time of overpasses over?